Edward Buckingham was born and raised in Cornwall, where he still lives and works today. He was the first Cornishman to climb the highest summit on each of the world’s seven continents and he is probably the first postman to achieve this amazing feat. 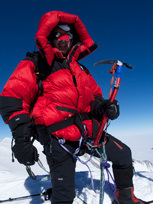 Edward has published a book called 7 Summits: 1 Cornishman Climbing the Highest Mountain on Earth, which tells of his hard-ship and near-death experiences in the ultimate test of endurance. 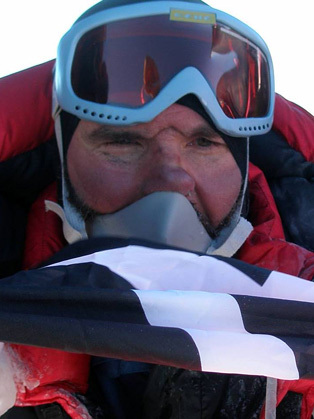 Edward was awarded the Cornish Gorsedh award for Exceptional Endeavour in 2013 in recognition of being the first person to raise the St Piran’s Cornish flag on the summit of Everest. If nothing else Edward is an inspiration in how far a bit of motivation and a lot of determination can take on person. 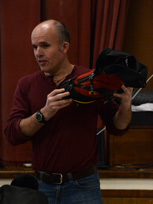 Edward has faced setbacks along the way, with it taking him three attempts to climb Mont Blanc (the first two occasions being weather conditions), having minor frostbite and recovering from a cruciate knee ligament injury in 2007, to go on and then climb Everest. Through perseverance he re-grouped and came back again and again, to face his greatest challenges and pushed him to the limits both physically and mentally. 7 Summits, 2016: "7 Summits is the story of a Cornishman climbing the highest mountains on each continent. The story starts from a position of adversity but then goes on a challenging, dangerous, exhilarating journey. 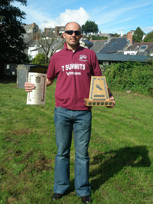 There have been setbacks along the way but ultimately has been hugely rewarding and lets not forget successful. Through it all I have an appreciation of my humble background and maintain my integrity and dignity I was brought into this world with." Met Ed properly at the 2017 Port Eliot Festival, where he guest presented at Survival Wisdoms Outdoor Adventure St and. He is an extremely charismatic and inspirational guy, who by his nature can inspire and motivate anyone to get up, and do something outdoorsy! What a story, from a survival perspective what drives him and what keeps him safe is absolutely fascinating! This guy has quietly done it all, 1 Cornishman, 7 Summits. The questions what's next? I have known Ed for some time as we both are members of the same running club. I had known he had climbed mountains but knew of no real idea to what extent. I recently went to a networking event where Ed was the main speaker and was blown away. I would without hesitation recommend Ed to anyone who is looking for a motivational speaker. I heard Ed Buckingham speak recently at the Plymouth Women in Business Networking event. The story of his adventure to complete the 7 Summit Challenge was awe inspiring and proof that dedication, passion and self belief is all you need to accomplish your dream. Brilliant!